With their refined and timeless design, our Canterbury dining sets will look stunning in any outdoor space. Our Canterbury dining sets feature solid, fixed teak dining tables and stackable chairs, making them ideal for smaller outdoor areas that want to save space. Made with the finest grade-A teak, our teak dining tables can remain outdoors all year round even in the harshest of weather conditions. 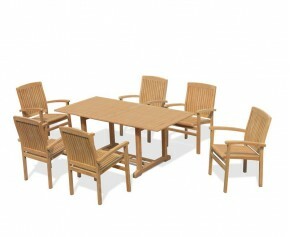 This 6 seater teak garden table and chairs set is distinctive in both comfort and style. Offering a superb combination of traditional material and contemporary style, this great value teak fixed table and chairs set has been expertly manufactured in sustainably sourced A-grade teak for long life and aesthetic appeal. Built with durability in mind, our Canterbury dining sets are guaranteed to provide long lasting al fresco dining for years to come. Making a stunning focal point, these teak dining tables are sure to delight you and your guests.